Poland held its first round of “free” democratic elections after independence from the Eastern Bloc in 1991. A whopping 29 political parties earned seats in the parliamentary houses of the National Assembly. At the time, the curious success of the Polish Beer Lovers’ Party, which earned 16 seats in parliament, was the topic of international news coverage. Several election cycles later, in 2007, another curious pattern emerged in election results, this one unconnected to any beer-based party platform. The below map illustrates election results broken down by district. 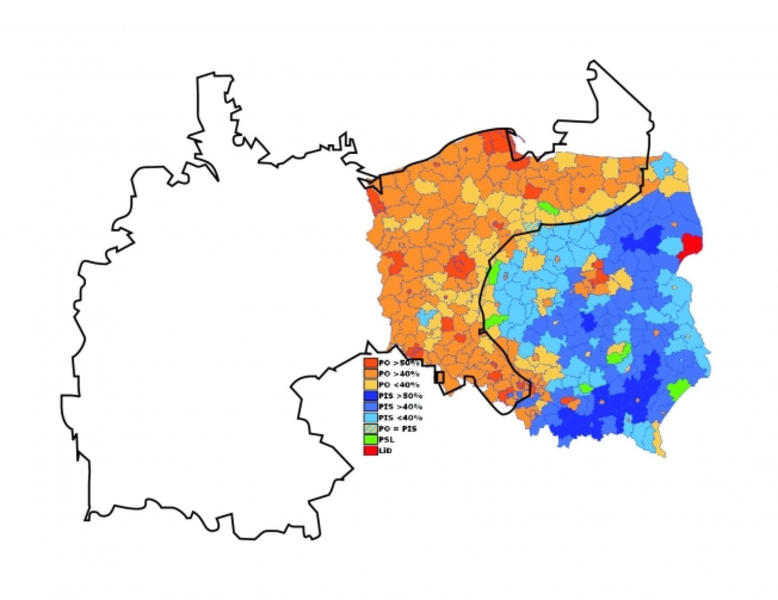 The shades of orange represent the right-wing liberal Civic Platform Party (Platforma Obywatelska, or PO), while the conservative Law and Justice Party (Prawa i Sprawiedliwość, or PIS) appears in indigo/purple. What’s interesting about this map isn’t the election results themselves (it was a victory year for the PO, if anyone is keeping track), but rather the geographic pattern they generated when mapped. With startlingly few exceptions, districts west of the imaginary division line voted PO, while those to the east voted PIS. It’s a very interesting picture of national politics, but not one with an immediately clear explanation. To make sense of voter behavior, one actually needs a historical snapshot dating back to 1871. Well over a century before the 2007 election cycle began, there were two different regions of modern-day Poland forming under two very different regimes—Kaiser Wilhelm’s newly-unified Germany grew to be an industrial powerhouse in the west, while the eastern part of the country was under Russian influence for much of the period between the late 19th century and today. This is why historical snapshots are so important. History helps analysts make the leap from pattern to correlation, or from correlation to causal relationship. 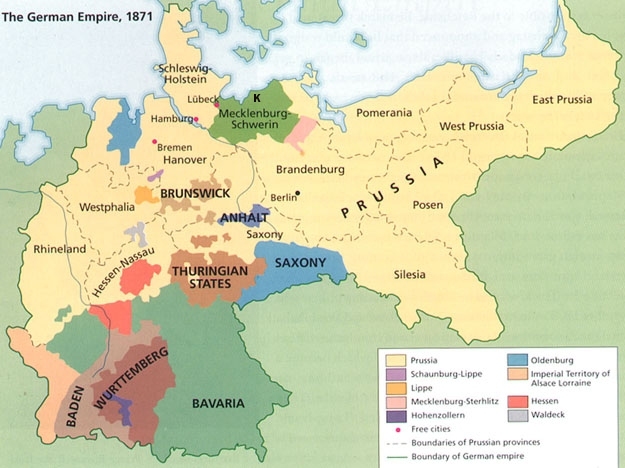 Understanding the difference between life in the former German Empire and Tsarist Russia helps political scientists understand the economic, civil, and infrastructural motivations of voters from both sides of the line.